Talk about surf online anonymously we like use some useful proxy clients, anonymous network like Tor, VPN. Today, I like introduce another way - HTTP Tunnel. It is not a new way for some people who know about network, HTTP Tunnel can bypass firewall, secure internet browsing. Maybe some people have experience with HTTP-Tunnel, thit is a HTTP Tunnel client that I mentioned before. But today I want talk about another free HTTP Tunnel client and service. 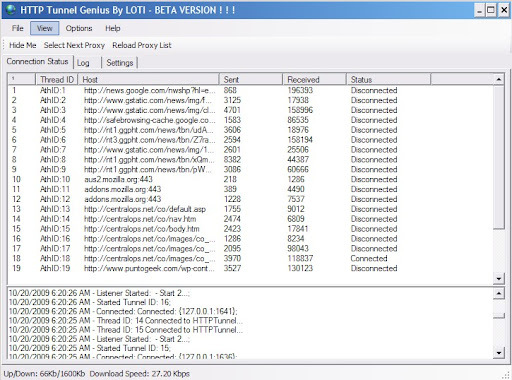 HTTP Tunnel Genius is my subject today, it can help you surf internet anonymously, use applications (Instant Messenger, browser) from behind restrictive firewall. To use this client is very easy, you do not have to configure anything on client (basic mode), only you have to do is change your browser Network Connection setting (127.0.0.1:1978). The client will automatic search public proxy when you open it, after a while you can browse websites. Very easy to use, even you can change different IP address by click "Select Next Proxy" on tool bar. About speed, I think it is OK if you are not watch high definition video, it uses public proxy, so do not use it enter your personal account. 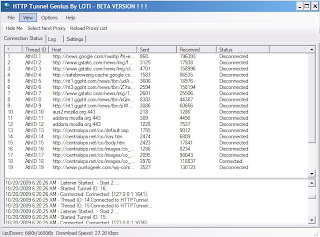 Direct download HTTP Tunnel Genius. Your computer should have Microsoft .NET Framework Version 2.0 Redistributable Package to run this client.